This article is about the language. For other uses, see Serbo-Croatian (disambiguation). Serbo-Croatian (/ˌsɜːrboʊkroʊˈeɪʃən, -bə-/ ( listen); srpskohrvatski / српскохрватски also called Serbo-Croat /ˌsɜːrboʊˈkroʊæt, -bə-/, Serbo-Croat-Bosnian (SCB), Bosnian-Croatian-Serbian (BCS), or Bosnian-Croatian-Montenegrin-Serbian (BCMS)) is a South Slavic language and the primary language of Serbia, Croatia, Bosnia and Herzegovina, and Montenegro. It is a pluricentric language with four mutually intelligible standard varieties. South Slavic dialects historically formed a continuum. The turbulent history of the area, particularly due to expansion of the Ottoman Empire, resulted in a patchwork of dialectal and religious differences. Due to population migrations, Shtokavian became the most widespread dialect in the western Balkans, intruding westwards into the area previously occupied by Chakavian and Kajkavian (which further blend into Slovenian in the northwest). Bosniaks, Croats and Serbs differ in religion and were historically often part of different cultural circles, although a large part of the nations have lived side by side under foreign overlords. During that period, the language was referred to under a variety of names, such as "Slavic" in general or "Serbian", "Croatian", ”Bosnian”, "Slavonian" or "Dalmatian" in particular. In a classicizing manner, it was also referred to as "Illyrian". The process of linguistic standardization of Serbo-Croatian was originally initiated in the mid-19th-century Vienna Literary Agreement by Croatian and Serbian writers and philologists, decades before a Yugoslav state was established. From the very beginning, there were slightly different literary Serbian and Croatian standards, although both were based on the same Shtokavian subdialect, Eastern Herzegovinian. In the 20th century, Serbo-Croatian served as the official language of the Kingdom of Yugoslavia (when it was called "Serbo-Croato-Slovenian"), and later as one of the official languages of the Socialist Federal Republic of Yugoslavia. The breakup of Yugoslavia affected language attitudes, so that social conceptions of the language separated on ethnic and political lines. Since the breakup of Yugoslavia, Bosnian has likewise been established as an official standard in Bosnia and Herzegovina, and there is an ongoing movement to codify a separate Montenegrin standard. 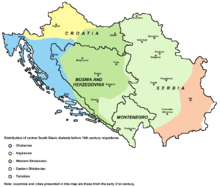 Serbo-Croatian thus generally goes by the names Serbian, Croatian, Bosnian, and sometimes Montenegrin and Bunjevac. Like other South Slavic languages, Serbo-Croatian has a simple phonology, with the common five-vowel system and twenty-five consonants. Its grammar evolved from Common Slavic, with complex inflection, preserving seven grammatical cases in nouns, pronouns, and adjectives. Verbs exhibit imperfective or perfective aspect, with a moderately complex tense system. Serbo-Croatian is a pro-drop language with flexible word order, subject–verb–object being the default. It can be written in Serbian Cyrillic or Gaj's Latin alphabet, whose thirty letters mutually map one-to-one, and the orthography is highly phonemic in all standards. Throughout the history of the South Slavs, the vernacular, literary, and written languages (e.g. Chakavian, Kajkavian, Shtokavian) of the various regions and ethnicities developed and diverged independently. Prior to the 19th century, they were collectively called "Illyric", "Slavic", "Slavonian", "Bosnian", "Dalmatian", "Serbian" or "Croatian". Since the XIX century the term Illyrian or Illyric was used quite often (thus creating confusion with the Illyrian language). Although the word Illyrian was used on a few occasions before, the widespread usage of the term began after Ljudevit Gaj and several other prominent linguists met at Ljudevit Vukotinović's house to discuss the issue in 1832. The term Serbo-Croatian was first used by Jacob Grimm in 1824, popularized by the Viennese philologist Jernej Kopitar in the following decades, and accepted by Croatian Zagreb grammarians in 1854 and 1859. At that time, Serb and Croat lands were still part of the Ottoman and Austrian Empires. Officially, the language was called variously Serbo-Croat, Croato-Serbian, Serbian and Croatian, Croatian and Serbian, Serbian or Croatian, Croatian or Serbian. Unofficially, Serbs and Croats typically called the language "Serbian" or "Croatian", respectively, without implying a distinction between the two, and again in independent Bosnia and Herzegovina, "Bosnian", "Croatian", and "Serbian" were considered to be three names of a single official language. Croatian linguist Dalibor Brozović advocated the term Serbo-Croatian as late as 1988, claiming that in an analogy with Indo-European, Serbo-Croatian does not only name the two components of the same language, but simply charts the limits of the region in which it is spoken and includes everything between the limits (‘Bosnian’ and ‘Montenegrin’). Today, use of the term "Serbo-Croatian" is controversial due to the prejudice that nation and language must match. It is still used for lack of a succinct alternative, though alternative names have emerged, such as Bosnian/Croatian/Serbian (BCS), which is often seen in political contexts such as the International Criminal Tribunal for the former Yugoslavia. [where?][when? ]Old Church Slavonic was adopted as the language of the liturgy. This language was gradually adapted to non-liturgical purposes and became known as the Croatian version of Old Slavonic. The two variants of the language, liturgical and non-liturgical, continued to be a part of the Glagolitic service as late as the middle of the 19th century. The earliest known Croatian Church Slavonic Glagolitic manuscripts are the Glagolita Clozianus and the Vienna Folia from the 11th century. An example of Old Croatian used in Baška tablet. The beginning of written Serbo-Croatian can be traced from the 10th century and on when Serbo-Croatian medieval texts were written in five scripts: Latin, Glagolitic, Early Cyrillic, Bosnian Cyrillic (bosančica/bosanica), and Arebica, the last principally by Bosniak nobility. Serbo-Croatian competed with the more established literary languages of Latin and Old Slavonic in the west and Persian and Arabic in the east. Old Slavonic developed into the Serbo-Croatian variant of Church Slavonic between the 12th and 16th centuries. Among the earliest attestations of Serbo-Croatian are the Humac tablet, dating from the 10th or 11th century, written in Bosnian Cyrillic and Glagolitic; the Plomin tablet, dating from the same era, written in Glagolitic; the Valun tablet, dated to the 11th century, written in Glagolitic and Latin; and the Inscription of Župa Dubrovačka, a Glagolitic tablet dated to the 11th century. The Baška tablet from the late 11th century was written in Glagolitic. It is a large stone tablet found in the small Church of St. Lucy, Jurandvor on the Croatian island of Krk that contains text written mostly in Chakavian in the Croatian angular Glagolitic script. It is also important in the history of the nation as it mentions Zvonimir, the king of Croatia at the time. The Charter of Ban Kulin of 1189, written by Ban Kulin of Bosnia, was an early Shtokavian text, written in Bosnian Cyrillic. The luxurious and ornate representative texts of Serbo-Croatian Church Slavonic belong to the later era, when they coexisted with the Serbo-Croatian vernacular literature. 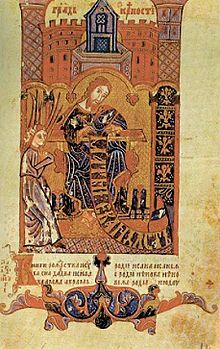 The most notable are the "Missal of Duke Novak" from the Lika region in northwestern Croatia (1368), "Evangel from Reims" (1395, named after the town of its final destination), Hrvoje's Missal from Bosnia and Split in Dalmatia (1404), and the first printed book in Serbo-Croatian, the Glagolitic Missale Romanum Glagolitice (1483). During the 13th century Serbo-Croatian vernacular texts began to appear, the most important among them being the "Istrian land survey" of 1275 and the "Vinodol Codex" of 1288, both written in the Chakavian dialect. The Shtokavian dialect literature, based almost exclusively on Chakavian original texts of religious provenance (missals, breviaries, prayer books) appeared almost a century later. The most important purely Shtokavian vernacular text is the Vatican Croatian Prayer Book (c. 1400). Both the language used in legal texts and that used in Glagolitic literature gradually came under the influence of the vernacular, which considerably affected its phonological, morphological, and lexical systems. From the 14th and the 15th centuries, both secular and religious songs at church festivals were composed in the vernacular. Writers of early Serbo-Croatian religious poetry (začinjavci) gradually introduced the vernacular into their works. These začinjavci were the forerunners of the rich literary production of the 16th-century literature, which, depending on the area, was Chakavian-, Kajkavian-, or Shtokavian-based. The language of religious poems, translations, miracle and morality plays contributed to the popular character of medieval Serbo-Croatian literature. One of the earliest dictionaries, also in the Slavic languages as a whole, was the Bosnian–Turkish Dictionary of 1631 authored by Muhamed Hevaji Uskufi and was written in the Arebica script. In the mid-19th century, Serbian (led by self-taught writer and folklorist Vuk Stefanović Karadžić) and most Croatian writers and linguists (represented by the Illyrian movement and led by Ljudevit Gaj and Đuro Daničić), proposed the use of the most widespread dialect, Shtokavian, as the base for their common standard language. Karadžić standardised the Serbian Cyrillic alphabet, and Gaj and Daničić standardized the Croatian Latin alphabet, on the basis of vernacular speech phonemes and the principle of phonological spelling. In 1850 Serbian and Croatian writers and linguists signed the Vienna Literary Agreement, declaring their intention to create a unified standard. Thus a complex bi-variant language appeared, which the Serbs officially called "Serbo-Croatian" or "Serbian or Croatian" and the Croats "Croato-Serbian", or "Croatian or Serbian". Yet, in practice, the variants of the conceived common literary language served as different literary variants, chiefly differing in lexical inventory and stylistic devices. The common phrase describing this situation was that Serbo-Croatian or "Croatian or Serbian" was a single language. During the Austro-Hungarian occupation of Bosnia and Herzegovina, the language of all three nations was called "Bosnian" until the death of administrator von Kállay in 1907, at which point the name was changed to "Serbo-Croatian". With unification of the first the Kingdom of the Serbs, Croats, and Slovenes – the approach of Karadžić and the Illyrians became dominant. 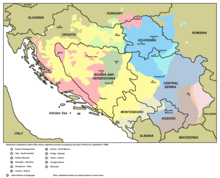 The official language was called "Serbo-Croato-Slovenian" (srpsko-hrvatsko-slovenački) in the 1921 constitution. In 1929, the constitution was suspended, and the country was renamed the Kingdom of Yugoslavia, while the official language of Serbo-Croato-Slovene was reinstated in the 1931 constitution. In June 1941, the Nazi puppet Independent State of Croatia began to rid the language of "Eastern" (Serbian) words, and shut down Serbian schools. On January 15, 1944, the Anti-Fascist Council of the People's Liberation of Yugoslavia (AVNOJ) declared Croatian, Serbian, Slovene, and Macedonian to be equal in the entire territory of Yugoslavia. In 1945 the decision to recognize Croatian and Serbian as separate languages was reversed in favor of a single Serbo-Croatian or Croato-Serbian language. In the Communist-dominated second Yugoslavia, ethnic issues eased to an extent, but the matter of language remained blurred and unresolved. In 1954, major Serbian and Croatian writers, linguists and literary critics, backed by Matica srpska and Matica hrvatska signed the Novi Sad Agreement, which in its first conclusion stated: "Serbs, Croats and Montenegrins share a single language with two equal variants that have developed around Zagreb (western) and Belgrade (eastern)". The agreement insisted on the equal status of Cyrillic and Latin scripts, and of Ekavian and Ijekavian pronunciations. It also specified that Serbo-Croatian should be the name of the language in official contexts, while in unofficial use the traditional Serbian and Croatian were to be retained. Matica hrvatska and Matica srpska were to work together on a dictionary, and a committee of Serbian and Croatian linguists was asked to prepare a pravopis. During the sixties both books were published simultaneously in Ijekavian Latin in Zagreb and Ekavian Cyrillic in Novi Sad. Yet Croatian linguists claim that it was an act of unitarianism. The evidence supporting this claim is patchy: Croatian linguist Stjepan Babić complained that the television transmission from Belgrade always used the Latin alphabet— which was true, but was not proof of unequal rights, but of frequency of use and prestige. Babić further complained that the Novi Sad Dictionary (1967) listed side by side words from both the Croatian and Serbian variants wherever they differed, which one can view as proof of careful respect for both variants, and not of unitarism. Moreover, Croatian linguists criticized those parts of the Dictionary for being unitaristic that were written by Croatian linguists. And finally, Croatian linguists ignored the fact that the material for the Pravopisni rječnik came from the Croatian Philological Society. Regardless of these facts, Croatian intellectuals brought the Declaration on the Status and Name of the Croatian Literary Language in 1967. On occasion of the publication's 45th anniversary, the Croatian weekly journal Forum published the Declaration again in 2012, accompanied by a critical analysis. West European scientists judge the Yugoslav language policy as an exemplary one: although three-quarters of the population spoke one language, no single language was official on a federal level. Official languages were declared only at the level of constituent republics and provinces, and very generously: Vojvodina had five (among them Slovak and Romanian, spoken by 0.5 per cent of the population), and Kosovo four (Albanian, Turkish, Romany and Serbo-Croatian). Newspapers, radio and television studios used sixteen languages, fourteen were used as languages of tuition in schools, and nine at universities. Only the Yugoslav Army used Serbo-Croatian as the sole language of command, with all other languages represented in the army's other activities—however, this is not different from other armies of multilingual states, or in other specific institutions, such as international air traffic control where English is used worldwide. All variants of Serbo-Croatian were used in state administration and republican and federal institutions. Both Serbian and Croatian variants were represented in respectively different grammar books, dictionaries, school textbooks and in books known as pravopis (which detail spelling rules). Serbo-Croatian was a kind of soft standardisation. However, legal equality could not dampen the prestige Serbo-Croatian had: since it was the language of three quarters of the population, it functioned as an unofficial lingua franca. And within Serbo-Croatian, the Serbian variant, with twice as many speakers as the Croatian, enjoyed greater prestige, reinforced by the fact that Slovene and Macedonian speakers preferred it to the Croatian variant because their languages are also Ekavian. This is a common situation in other pluricentric languages, e.g. the variants of German differ according to their prestige, the variants of Portuguese too. Moreover, all languages differ in terms of prestige: "the fact is that languages (in terms of prestige, learnability etc.) are not equal, and the law cannot make them equal". In 2017, the "Declaration of the Common Language" (Deklaracija o zajedničkom jeziku), signed by a group of NGOs and linguists from former Yugoslavia, argues that all variants belong to a common polycentric language. Countries where a standard form of Serbo-Croatian is an official language. Countries where one or more forms are designated as a minority languages. The total number of persons who declared their native language as either 'Bosnian', 'Croatian', 'Serbian', 'Montenegrin', or 'Serbo-Croatian' in countries of the region is about 16 million. Serbian is spoken by about 9.5 million, mostly in Serbia (6.7m), Bosnia and Herzegovina (1.4m), and Montenegro (0.4m). Serbian minorities are found in the Republic of Macedonia and in Romania. In Serbia, there are about 760,000 second-language speakers of Serbian, including Hungarians in Vojvodina and the 400,000 estimated Roma. Familiarity of Kosovo Albanians with Serbian in Kosovo varies depending on age and education, and exact numbers are not available. Croatian is spoken by roughly 4.8 million, including some 575,000 in Bosnia and Herzegovina. A small Croatian minority that lives in Italy, known as Molise Croats, have somewhat preserved traces of the Croatian language. In Croatia, 170,000, mostly Italians and Hungarians, use it as a second language. Bosnian is spoken by 2.2 million people, chiefly Bosniaks, including about 220,000 in Serbia and Montenegro. The notion of Montenegrin as a separate standard from Serbian is relatively recent. In the 2003 census, around 150,000 Montenegrins, of the country's 620,000, declared Montenegrin as their native language. That figure is likely to increase, due to the country's independence and strong institutional backing of Montenegrin language. 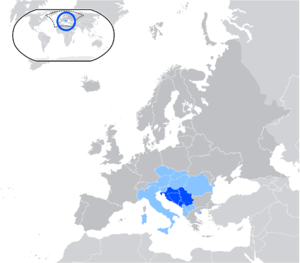 Serbo-Croatian is also a second language of many Slovenians and Macedonians, especially those born during the time of Yugoslavia. According to the 2002 Census, Serbo-Croatian and its variants have the largest number of speakers of the minority languages in Slovenia. Outside the Balkans, there are over 2 million native speakers of the language(s), especially in countries which are frequent targets of immigration, such as Australia, Austria, Brazil, Canada, Chile, Germany, Hungary, Italy, Sweden and the United States. For all nouns and adjectives, the instrumental, dative, and locative forms are identical (at least orthographically) in the plural: ženama, ženama, ženama; očima, očima, očima; riječima, riječima, riječima. There is an accentual difference between the genitive singular and genitive plural of masculine and neuter nouns, which are otherwise homonyms (seljaka, seljaka) except that on occasion an "a" (which might or might not appear in the singular) is filled between the last letter of the root and the genitive plural ending (kapitalizma, kapitalizama). The old instrumental ending "ju" of the feminine consonant stems and in some cases the "a" of the genitive plural of certain other sorts of feminine nouns is fast yielding to "i": noći instead of noćju, borbi instead of boraba and so forth. Almost every Shtokavian number is indeclinable, and numbers after prepositions have not been declined for a long time. Like most Slavic languages, there are mostly three genders for nouns: masculine, feminine, and neuter, a distinction which is still present even in the plural (unlike Russian and, in part, the Čakavian dialect). They also have two numbers: singular and plural. However, some consider there to be three numbers (paucal or dual, too), since (still preserved in closely related Slovene) after two (dva, dvije/dve), three (tri) and four (četiri), and all numbers ending in them (e.g. twenty-two, ninety-three, one hundred four) the genitive singular is used, and after all other numbers five (pet) and up, the genitive plural is used. (The number one [jedan] is treated as an adjective.) Adjectives are placed in front of the noun they modify and must agree in both case and number with it. There are seven tenses for verbs: past, present, future, exact future, aorist, imperfect, and pluperfect; and three moods: indicative, imperative, and conditional. However, the latter three tenses are typically used only in Shtokavian writing, and the time sequence of the exact future is more commonly formed through an alternative construction. In addition, like most Slavic languages, the Shtokavian verb also has one of two aspects: perfective or imperfective. Most verbs come in pairs, with the perfective verb being created out of the imperfective by adding a prefix or making a stem change. The imperfective aspect typically indicates that the action is unfinished, in progress, or repetitive; while the perfective aspect typically denotes that the action was completed, instantaneous, or of limited duration. Some Štokavian tenses (namely, aorist and imperfect) favor a particular aspect (but they are rarer or absent in Čakavian and Kajkavian). Actually, aspects "compensate" for the relative lack of tenses, because aspect of the verb determines whether the act is completed or in progress in the referred time. The vowels can be short or long, but the phonetic quality does not change depending on the length. In a word, vowels can be long in the stressed syllable and the syllables following it, never in the ones preceding it. The consonant system is more complicated, and its characteristic features are series of affricate and palatal consonants. As in English, voice is phonemic, but aspiration is not. In consonant clusters all consonants are either voiced or voiceless. All the consonants are voiced if the last consonant is normally voiced or voiceless if the last consonant is normally voiceless. This rule does not apply to approximants – a consonant cluster may contain voiced approximants and voiceless consonants; as well as to foreign words (Washington would be transcribed as VašinGton), personal names and when consonants are not inside of one syllable. /r/ can be syllabic, playing the role of the syllable nucleus in certain words (occasionally, it can even have a long accent). For example, the tongue-twister navrh brda vrba mrda involves four words with syllabic /r/. A similar feature exists in Czech, Slovak, and Macedonian. Very rarely other sonorants can be syllabic, like /l/ (in bicikl), /ʎ/ (surname Štarklj), /n/ (unit njutn), as well as /m/ and /ɲ/ in slang. The tone stressed vowels can be approximated in English with set vs. setting? said in isolation for a short tonic e, or leave vs. leaving? for a long tonic i, due to the prosody of final stressed syllables in English. Accent can never occur on the last syllable of polysyllabic words. There are no other rules for accent placement, thus the accent of every word must be learned individually; furthermore, in inflection, accent shifts are common, both in type and position (the so-called "mobile paradigms"). The second rule is not strictly obeyed, especially in borrowed words. Comparative and historical linguistics offers some clues for memorising the accent position: If one compares many standard Serbo-Croatian words to e.g. cognate Russian words, the accent in the Serbo-Croatian word will be one syllable before the one in the Russian word, with the rising tone. Historically, the rising tone appeared when the place of the accent shifted to the preceding syllable (the so-called "Neoshtokavian retraction"), but the quality of this new accent was different – its melody still "gravitated" towards the original syllable. Most Shtokavian dialects (Neoshtokavian) dialects underwent this shift, but Chakavian, Kajkavian and the Old Shtokavian dialects did not. Accent diacritics are not used in the ordinary orthography, but only in the linguistic or language-learning literature (e.g. dictionaries, orthography and grammar books). However, there are very few minimal pairs where an error in accent can lead to misunderstanding. Glagolitic alphabet, chiefly in Croatia. Arabic alphabet (mostly in Bosnia). various modifications of the Latin and Greek alphabets. The oldest texts since the 11th century are in Glagolitic, and the oldest preserved text written completely in the Latin alphabet is "Red i zakon sestara reda Svetog Dominika", from 1345. The Arabic alphabet had been used by Bosniaks; Greek writing is out of use there, and Arabic and Glagolitic persisted so far partly in religious liturgies. Today, it is written in both the Latin and Cyrillic scripts. Serbian and Bosnian variants use both alphabets, while Croatian uses the Latin only. Latin script has become more and more popular in Serbia, as it is easy to input on phones and computers. The Serbian Cyrillic alphabet was revised by Vuk Stefanović Karadžić in the 19th century. The Croatian Latin alphabet (Gajica) followed suit shortly afterwards, when Ljudevit Gaj defined it as standard Latin with five extra letters that had diacritics, apparently borrowing much from Czech, but also from Polish, and inventing the unique digraphs "lj", "nj" and "dž". These digraphs are represented as "ļ, ń and ǵ" respectively in the "Rječnik hrvatskog ili srpskog jezika", published by the former Yugoslav Academy of Sciences and Arts in Zagreb. The latter digraphs, however, are unused in the literary standard of the language. All in all, this makes Serbo-Croatian the only Slavic language to officially use both the Latin and Cyrillic scripts, albeit the Latin version is more commonly used. The digraphs Lj, Nj and Dž represent distinct phonemes and are considered to be single letters. In crosswords, they are put into a single square, and in sorting, lj follows l and nj follows n, except in a few words where the individual letters are pronounced separately. For instance, nadživ(j)eti "to outlive" is composed of the prefix nad- "out, over" and the verb živ(j)eti "to live". The Cyrillic alphabet avoids such ambiguity by providing a single letter for each phoneme. Đ used to be commonly written as Dj on typewriters, but that practice led to too many ambiguities. It is also used on car license plates. Today Dj is often used again in place of Đ on the Internet as a replacement due to the lack of installed Serbo-Croat keyboard layouts. Unicode has separate characters for the digraphs lj (Ǉ, ǈ, ǉ), nj (Ǌ, ǋ, ǌ) and dž (Ǆ, ǅ, ǆ). South Slavic historically formed a dialect continuum, i.e. each dialect has some similarities with the neighboring one, and differences grow with distance. However, migrations from the 16th to 18th centuries resulting from the spread of Ottoman Empire on the Balkans have caused large-scale population displacement that broke the dialect continuum into many geographical pockets. Migrations in the 20th century, primarily caused by urbanization and wars, also contributed to the reduction of dialectal differences. The primary dialects are named after the most common question word for what: Shtokavian uses the pronoun što or šta, Chakavian uses ča or ca, Kajkavian (kajkavski), kaj or kej. In native terminology they are referred to as nar(j)ečje, which would be equivalent of "group of dialects", whereas their many subdialects are referred to as dijalekti "dialects" or govori "speeches". The pluricentric Serbo-Croatian standard language and all four contemporary standard variants are based on the Eastern Herzegovinian subdialect of Neo-Shtokavian. Other dialects are not taught in schools or used by the state media. The Torlakian dialect is often added to the list, though sources usually note that it is a transitional dialect between Shtokavian and the Bulgaro-Macedonian dialects. Shtokavian subdialects (Pavle Ivić, 1988). Yellow is the widespread Eastern Herzegovinian subdialect that forms the basis of all national standards, though it is not spoken natively in any of the capital cities. The Serbo-Croatian dialects differ not only in the question word they are named after, but also heavily in phonology, accentuation and intonation, case endings and tense system (morphology) and basic vocabulary. In the past, Chakavian and Kajkavian dialects were spoken on a much larger territory, but have been replaced by Štokavian during the period of migrations caused by Ottoman Turkish conquest of the Balkans in the 15th and the 16th centuries. These migrations caused the koinéisation of the Shtokavian dialects, that used to form the West Shtokavian (more closer and transitional towards the neighbouring Chakavian and Kajkavian dialects) and East Shtokavian (transitional towards the Torlakian and the whole Bulgaro-Macedonian area) dialect bundles, and their subsequent spread at the expense of Chakavian and Kajkavian. As a result, Štokavian now covers an area larger than all the other dialects combined, and continues to make its progress in the enclaves where non-literary dialects are still being spoken. The differences among the dialects can be illustrated on the example of Schleicher's fable. Diacritic signs are used to show the difference in accents and prosody, which are often quite significant, but which are not reflected in the usual orthography. Óvca rȅče kònjima: «Sȑce me bòlī glȅdajūći čòv(j)eka kako jȁšē na kònju». A kònji rȅkoše: «Slȕšāj, ȏvco, nȃs sȑca bòlē kada vȉdīmo da čòv(j)ek, gospòdār, rȃdī vȕnu od ovácā i prȁvī òd(j)eću zá se. I ȍndā óvca nȇmā vȉše vȕnē. Óvca kȃza kȍnjima: «Svȅ me bolĩ kad glȅdām kako čòvik na kònju jȁšī». A kònji kāzȁše: «Slȕšāj, ȏvco, nãs sȑca bolũ kad vȉdīmo da čòvik, gȁzda, prȁvī vȕnu od ovãc i prȁvī rȍbu zá se od njẽ. I ȍndā ōvcȁ néma vȉšē vȕnē. Ovcȁ je reklȁ konjȇn: «Sȑce me bolĩ dok glȅdan čovȅka kako jȁše na konjȅ». A konjȉ su reklȉ: «Poslȕšaj, ovcȁ, nȃs sȑca bolẽ kad vȉdimo da čovȅk, gospodãr dȅla vȕnu od ovãc i dȅla rȍbu zȃ se. I ȍnda ovcȁ nĩma vȉše vȕni. õfca tera nı̃je imȅ̩la vȕne vȉdla je kȍjne na briẽgu. Jȇn od nîh je vlẽ̩ke̩l tẽška kȍla, drȕgi je nȍsil vȅliku vrȅ̩ču, a trẽjti je nȍsil čovȅ̩ka. õfca je rȇkla kȍjnem: «Sȑce me bolĩ kad vîdim čovȅka kak jȃše na kȍjnu». A kȍjni su rȇkli: «Poslȕhni, õfca, nȃs sȑca bolĩju kad vîdime da čȍve̩k, gospodãr, dȇ̩la vȕnu ot õfci i dȇ̩la oblȅ̩ku zȃ se. I ȏnda õfca nȇma vȉše vȕne. [On a hill,] a sheep that had no wool saw horses, one of them pulling a heavy wagon, one carrying a big load, and one carrying a man quickly. The sheep said to the horses: "My heart pains me, seeing a man driving horses". The horses said: "Listen, sheep, our hearts pain us when we see this: a man, the master, makes the wool of the sheep into a warm garment for himself. And the sheep has no wool". Having heard this, the sheep fled into the plain. A basic distinction among the dialects is in the reflex of the long Common Slavic vowel jat, usually transcribed as *ě. Depending on the reflex, the dialects are divided into Ikavian, Ekavian, and Ijekavian, with the reflects of jat being /i/, /e/, and /ije/ or /je/ respectively. The long and short jat is reflected as long or short */i/ and /e/ in Ikavian and Ekavian, but Ijekavian dialects introduce a ije/je alternation to retain a distinction. Standard Croatian and Bosnian are based on Ijekavian, whereas Serbian uses both Ekavian and Ijekavian forms (Ijekavian for Bosnian Serbs, Ekavian for most of Serbia). Influence of standard language through state media and education has caused non-standard varieties to lose ground to the literary forms. The jat-reflex rules are not without exception. For example, when short jat is preceded by r, in most Ijekavian dialects developed into /re/ or, occasionally, /ri/. The prefix prě- ("trans-, over-") when long became pre- in eastern Ijekavian dialects but to prije- in western dialects; in Ikavian pronunciation, it also evolved into pre- or prije- due to potential ambiguity with pri- ("approach, come close to"). For verbs that had -ěti in their infinitive, the past participle ending -ěl evolved into -io in Ijekavian Neoštokavian. The nature and classification of Serbo-Croatian has been the subject of long-standing sociolinguistic debate. The question is whether Serbo-Croatian should be called a single language or a cluster of closely related languages. Enisa Kafadar[who?] argues that there is only one Serbo-Croatian language with several varieties. This has made it possible to include all four varieties in new grammars of the language. Daniel Bunčić[who?] concludes that it is a pluricentric language, with four standard variants spoken in Serbia, Croatia, Montenegro and Bosnia and Herzegovina. The mutual intelligibility between their speakers "exceeds that between the standard variants of English, French, German, or Spanish". Other linguists have argued that the differences between the variants of Serbo-Croatian are less significant than those between the variants of English, German, Dutch, and Hindi–Urdu. Among pluricentric languages, Serbo-Croatian was the only one with a pluricentric standardisation within one state. The dissolution of Yugoslavia has made Serbo-Croatian even more of a typical pluricentric language, since the variants of other pluricentric languages are also spoken in different states. Ethno-political variants of Serbo-Croatian as of 2006. The use of Serbo-Croatian as a linguistic label has been the subject of long-standing controversy. Wayles Browne calls it a "term of convenience" and notes the difference of opinion as to whether it comprises a single language or a cluster of languages. Ronelle Alexander refers to the national standards as three separate languages, but also notes that the reasons for this are complex and generally non-linguistic. She calls BCS (her term for Serbo-Croatian) a single language for communicative linguistic purposes, but three separate languages for symbolic non-linguistic purposes. The current Serbian constitution of 2006 refers to the official language as Serbian, while the Montenegrin constitution of 2007 proclaimed Montenegrin as the primary official language, but also grants other languages the right of official use. Most Bosniaks refer to their language as Bosnian. Most Croats refer to their language as Croatian. Most Serbs refer to their language as Serbian. Montenegrins refer to their language either as Serbian or Montenegrin. Ethnic Bunjevci refer to their language as Bunjevac. The International Organization for Standardization (ISO) has specified different Universal Decimal Classification (UDC) numbers for Croatian (UDC 862, abbreviation hr) and Serbian (UDC 861, abbreviation sr), while the cover term Serbo-Croatian is used to refer to the combination of original signs (UDC 861/862, abbreviation sh). Furthermore, the ISO 639 standard designates the Bosnian language with the abbreviations bos and bs. The International Criminal Tribunal for the former Yugoslavia considers what it calls BCS (Bosnian-Croatian-Serbian) to be the main language of all Bosnian, Croatian, and Serbian defendants. The indictments, documents, and verdicts of the ICTY are not written with any regard for consistently following the grammatical prescriptions of any of the three standards – be they Serbian, Croatian, or Bosnian. For utilitarian purposes, the Serbo-Croatian language is often called "naš jezik" ("our language") or "naški" (sic. "Ourish" or "Ourian") by native speakers. This politically correct term is frequently used to describe the Serbo-Croatian language by those who wish to avoid nationalistic and linguistic discussions. Native speakers traditionally describe their language as "jedan ali ne jedinstven" 'one but not uniform'. The majority of mainstream Serbian linguists consider Serbian and Croatian to be one language, that is called Serbo-Croatian (srpskohrvatski) or Croato-Serbian (hrvatskosrpski). A minority of Serbian linguists are of the opinion that Serbo-Croatian did exist, but has, in the meantime, dissolved. The opinion of the majority of Croatian linguists is that there has never been a Serbo-Croatian language, but two different standard languages that overlapped sometime in the course of history. However, Croatian linguist Snježana Kordić has been leading an academic discussion on this issue in the Croatian journal Književna republika from 2001 to 2010. In the discussion, she shows that linguistic criteria such as mutual intelligibility, the huge overlap in the linguistic system, and the same dialect basis of the standard language are evidence that Croatian, Serbian, Bosnian and Montenegrin are four national variants of the pluricentric Serbo-Croatian language. Igor Mandić states: "During the last ten years, it has been the longest, the most serious and most acrid discussion (…) in 21st-century Croatian culture". Inspired by that discussion, a monograph on language and nationalism has been published. The view of the majority of Croatian linguists that there is no single Serbo-Croatian language but several different standard languages has been sharply criticized by German linguist Bernhard Gröschel in his monograph Serbo-Croatian Between Linguistics and Politics. Standard Croatian, Serbian, Bosnian, and Montenegrin are completely mutually intelligible. In addition, they use two alphabets that perfectly match each other (Latin and Cyrillic), thanks to Ljudevit Gaj and Vuk Karadžić. Croats exclusively use Latin script and Serbs equally use both Cyrillic and Latin. Although Cyrillic is taught in Bosnia, most Bosnians, especially non-Serbs (Bosniaks and Croats), favor Latin. The list of 100 words of the basic Croatian, Serbian, Bosnian, and Montenegrin vocabulary, as set out by Morris Swadesh, shows that all 100 words are identical. According to Swadesh, 81 per cent are sufficient to be considered as a single language. Typologically and structurally, these standard variants have virtually the same grammar, i.e. morphology and syntax. The Serbo-Croatian language was standardised in the mid-19th century, and all subsequent attempts to dissolve its basic unity have not succeeded. The affirmation of distinct Croatian, Serbian, Bosnian, and Montenegrin languages is politically motivated. According to phonology, morphology and syntax, these standard variants are essentially one language because they are based on the same, Štokavian dialect. Phonology, morphology, and syntax are not the only dimensions of a language: other fields (semantics, pragmatics, stylistics, lexicology, etc.) also differ slightly. However, it is the case with other pluricentric languages. A comparison is made to the closely related North Germanic languages (or dialects, if one prefers), though these are not fully mutually intelligible as the Serbo-Croatian standards are. A closer comparison may be General American and Received Pronunciation in English, which are closer to each other than the latter is to other dialects which are subsumed under "British English". Since the Croatian language as recorded in Držić and Gundulić's works (16th and 17th centuries) is virtually the same as the contemporary standard Croatian (understandable archaisms apart), it is evident that the 19th-century formal standardization was just the final touch in the process that, as far as the Croatian language is concerned, had lasted more than three centuries. The radical break with the past, characteristic of modern Serbian (whose vernacular was likely not as similar to Croatian as it is today), is a trait completely at variance with Croatian linguistic history. In short, formal standardization processes for Croatian and Serbian had coincided chronologically (and, one could add, ideologically), but they haven't produced a unified standard language. Gundulić did not write in "Serbo-Croatian", nor did August Šenoa. Marko Marulić and Marin Držić wrote in a sophisticated idiom of the Croatian language some 300–350 years before "Serbo-Croatian" ideology appeared. Marulić explicitly called his Čakavian-written Judita as u uerish haruacchi slosena ("arranged in Croatian stanzas") in 1501, and the Štokavian grammar and dictionary of Bartol Kašić written in 1604 unambiguously identifies the ethnonyms Slavic and Illyrian with Croatian. The linguistic debate in this region is more about politics than about linguistics per se. The topic of language for writers from Dalmatia and Dubrovnik prior to the 19th century made a distinction only between speakers of Italian or Slavic, since those were the two main groups that inhabited Dalmatian city-states at that time. Whether someone spoke Croatian or Serbian was not an important distinction then, as the two languages were not distinguished by most speakers. "As I have mentioned in the preface, history knows only two national names in these parts—Croatian and Serbian. As far as Dubrovnik is concerned, the Serbian name was never in use; on the contrary, the Croatian name was frequently used and gladly referred to"
"At the end of the 15th century [in Dubrovnik and Dalmatia], sermons and poems were exquisitely crafted in the Croatian language by those men whose names are widely renowned by deep learning and piety." On the other hand, the opinion of Jagić from 1864 is argued not to have firm grounds. When Jagić says "Croatian", he refers to a few cases referring to the Dubrovnik vernacular as ilirski (Illyrian). This was a common name for all Slavic vernaculars in Dalmatian cities among the Roman inhabitants. In the meantime, other written monuments are found that mention srpski, lingua serviana (= Serbian), and some that mention Croatian. By far the most competent Serbian scientist on the Dubrovnik language issue, Milan Rešetar, who was born in Dubrovnik himself, wrote behalf of language characteristics: "The one who thinks that Croatian and Serbian are two separate languages must confess that Dubrovnik always (linguistically) used to be Serbian." Finally, the former medieval texts from Dubrovnik and Montenegro dating before the 16th century were neither true Štokavian nor Serbian, but mostly specific a Jekavian-Čakavian that was nearer to actual Adriatic islanders in Croatia. Nationalists have conflicting views about the language(s). The nationalists among the Croats conflictingly claim either that they speak an entirely separate language from Serbs and Bosniaks or that these two peoples have, due to the longer lexicographic tradition among Croats, somehow "borrowed" their standard languages from them. Bosniak nationalists claim that both Croats and Serbs have "appropriated" the Bosnian language, since Ljudevit Gaj and Vuk Karadžić preferred the Neoštokavian-Ijekavian dialect, widely spoken in Bosnia and Herzegovina, as the basis for language standardization, whereas the nationalists among the Serbs claim either that any divergence in the language is artificial, or claim that the Štokavian dialect is theirs and the Čakavian Croats'— in more extreme formulations Croats have "taken" or "stolen" their language from the Serbs. Proponents of unity among Southern Slavs claim that there is a single language with normal dialectal variations. 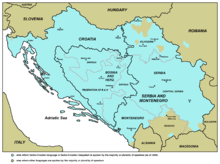 The term "Serbo-Croatian" (or synonyms) is not officially used in any of the successor countries of former Yugoslavia. In Serbia, the Serbian standard has an official status countrywide, while both Serbian and Croatian are official in the province of Vojvodina. A large Bosniak minority is present in the southwest region of Sandžak, but the "official recognition" of Bosnian is moot. Bosnian is an optional course in 1st and 2nd grade of the elementary school, while it is also in official use in the municipality of Novi Pazar. However, its nomenclature is controversial, as there is incentive that it is referred to as "Bosniak" (bošnjački) rather than "Bosnian" (bosanski) (see Bosnian language#Controversy and recognition for details). Croatian is the official language of Croatia, while Serbian is also official in municipalities with significant Serb population. In Bosnia and Herzegovina, all three standard languages are recorded as official but in practice and media, mostly Bosnian and Serbian are applied. Confrontations have on occasion been absurd. The academic Muhamed Filipović, in an interview to Slovenian television, told of a local court in a Croatian district requesting a paid translator to translate from Bosnian to Croatian before the trial could proceed. Since the year 2000, the ISO classification does not recognize Serbo-Croatian as an individual language. Originally included, it has been removed from the ISO 639-1 and ISO 639-2 standards, and consequently redefined as a "macrolanguage", a book-keeping device in the ISO 639-3 standard. Polje, from Serbo-Croatian polje "field"
Tamburitza, Serbo-Croatian diminutive of tambura, from Turkish, from Persian ṭambūr "tanbur"
Uvala, from Serbo-Croatian uvala "hollow"
^ "The Slavic Languages" (PDF). Cambridge Language Surveys. p. 7. Retrieved 19 June 2017. ^ "Constitution of the Republic of Kosovo" (PDF). p. 2. Retrieved 2012-08-17. ^ "Legge Regionale n.15 del 14 maggio 1997 - Tutela e valorizzazione del patrimonio culturale delle minoranze linguistiche nel Molise - Bollettino Ufficiale n. 10 del 16.5.1997" (PDF). Sardegna Cultura. Retrieved 2018-07-15. ^ "B92.net". B92.net. Archived from the original on 2013-11-10. Retrieved 2013-09-01. ^ "Minority Rights Group International : Czech Republic : Czech Republic Overview". Minorityrights.org. Retrieved 2012-10-24. ^ "Minority Rights Group International : Macedonia : Macedonia Overview". Minorityrights.org. Retrieved 2012-10-24. ^ Hammarström, Harald; Forkel, Robert; Haspelmath, Martin, eds. (2017). "Serbian-Croatian-Bosnian". Glottolog 3.0. Jena, Germany: Max Planck Institute for the Science of Human History. ^ Čamdžić, Amela; Hudson, Richard. "Serbo-Croat-Bosnian clitics and Word Grammar" (PDF). UCL Psychology and Language Sciences. Retrieved 11 September 2013. ^ a b Alexander 2006, p. XVII. ^ a b Thomas, Paul-Louis; Osipov, Vladimir (2012). Grammaire du bosniaque, croate, monténégrin, serbe [Grammar of Bosnian, Croatian, Montenegrin, and Serbian]. Collection de grammaires de l'Institut d'études slaves ; vol. 8 (in French). Paris: Institut d'études slaves. p. 624. ISBN 9782720404900. OCLC 805026664. Lay summary. ^ Mørk, Henning (2002). Serbokroatisk grammatik: substantivets morfologi [Serbo-Croatian Grammar: Noun Morphology]. Arbejdspapirer ; vol. 1 (in Danish). Århus: Slavisk Institut, Århus Universitet. p. unpaginated (Preface). OCLC 471591123. ^ Blum 2002, pp. 130–132. ^ a b c Busch, Birgitta; Kelly-Holmes, Helen (2004). Language, Discourse and Borders in the Yugoslav Successor States. Multilingual Matters. p. 26. ISBN 978-1-85359-732-9. ^ Kordić, Snježana (2010). "Moderne Nationalbezeichnungen und Texte aus vergangenen Jahrhunderten" [Modern nation names and texts in the past] (PDF). Zeitschrift für Balkanologie (in German). 46 (1): 40–41. ISSN 0044-2356. ZDB-ID 201058-6. Archived from the original on 23 August 2012. Retrieved 11 May 2014. ^ Despalatović, Elinor Murray (1975). Ljudevit Gaj and the Illyrian Movement. New York and London: East European Quarterly; Columbia University Press. p. 64. ISBN 978-0-914710-05-9. ^ Lencek 1976, p. 46. ^ Pohl 1996, pp. 209–210. ^ Lencek 1976, p. 49. ^ Brown & Anderson 2006, p. 259. ^ Brozović, Dalibor (1988). "Jezik, srpskohrvatski/hrvatskosrpski, hrvatski ili srpski" [Language, Serbo-Croatian/Croato-Serbian, Croatian or Serbian : Extract From the Second Edition of the Encyclopedia of Yugoslavia]. Jezik, srpskohrvatski/hrvatskosrpski, hrvatski ili srpski : izvadak iz II izdanja Enciklopedije Jugoslavije (in Serbo-Croatian). Zagreb: Jugoslavenski Leksikografski zavod "Miroslav Krleža". p. 4. ISBN 978-86-7053-014-0. OCLC 645757653. ^ Richter Malabotta, Melita (2004). "Semantics of War in Former Yugoslavia". In Busch, Brigitta; Kelly-Holmes, Helen (eds.). Language, Discourse and Borders in the Yugoslav Successor States. Clevedon: Multilingual Matters. p. 81. OCLC 803615012. ^ Mappes-Niediek 2005, p. 30. ^ Kordić, Snježana (2010). "Ideologija nacionalnog identiteta i nacionalne kulture" [The ideology of national identity and culture] (PDF). In Ajdačić, Dejan; Lazarević Di Đakomo, Persida (eds.). U čast Pera Jakobsena: zbornik radova. Studia in honorem ; vol. 1 (in Serbo-Croatian). Beograd: SlovoSlavia. pp. 225–239. ISBN 978-86-87807-02-0. OCLC 723062357. Archived from the original (PDF) on |archive-url= requires |archive-date= (help). ^ Obst, Ulrich (2004). "Zum genitivus qualitatis und zu alternativen Möglichkeiten in den drei 'Buddenbrooks'-Übersetzungen aus dem kroatischen und serbischen Sprachgebiet". In Okuka, Miloš; Schweier, Ulrich (eds.). Festschrift für Peter Rehder zum 65. Geburtstag. Welt der Slaven ; vol. 21 (in German). Munich: Otto Sagner. p. 212. OCLC 55018584. ^ Tomasz Kamusella. The Politics of Language and Nationalism in Modern Central Europe. Palgrave Macmillan, 2008. pp. 228, 297. ^ a b c Price, Glanville (1998). Encyclopedia of the languages of Europe. Oxford, UK: Blackwell Publishers Ltd. p. 425. ISBN 978-0-631-19286-2. ^ Kapetanovic, Amir (2005). "HRVATSKA SREDNJOVJEKOVNA LATINICA". Hrvatska Srednjovjekovna Latinica. ^ Fučić, Branko (September 1971). "Najstariji hrvatski glagoljski natpisi". Slovo (in Serbo-Croatian). 21. ^ "Hrvoje's Missal ~ 1403–1404". Retrieved 9 March 2012. ^ "VINODOLSKI ZAKON (1288)". Archived from the original on 14 March 2012. Retrieved 9 March 2012. ^ "Istarski Razvod". Archived from the original on 7 July 2012. Retrieved 9 March 2012. ^ "Vatikanski hrvatski molitvenik". Archived from the original on 11 October 2017. Retrieved 9 March 2012. ^ "Gammel ordbok i ny drakt" (in Norwegian). University of Oslo. 2012-04-10. Archived from the original on 2015-09-24. Retrieved 2013-12-09. ^ Tanović-Miller, Naza (2001). Testimony of a Bosnian. Texas A&M University Press. p. 209; "Turkish–Bosnian" dictionary, one of the first Slavic dictionaries in Europe, was written by a Bosnian ethnographer and poet, Muhamed Hevai Uskufi, from Tuzla in 1631. ^ Greenberg 2004, p. 24. ^ Sugar, Peter F. (1963). Industrialization of Bosnia-Hercegovina: 1878–1918. University of Washington Press. p. 201. ^ Ramet, Sabrina P. (2008). "Nationalism and the 'Idiocy' of the Countryside: The Case of Serbia". Serbia, Croatia and Slovenia at Peace and at War: Selected Writings, 1983–2007. LIT Verlag Münster. pp. 74–76. ISBN 978-3-03735-912-9. ^ Velikonja, Mitja (1992). Religious Separation and Political Intolerance in Bosnia-Herzegovina. Texas A&M University Press. ISBN 978-1-58544-226-3. ^ Tomasevich, Jozo (1969). Contemporary Yugoslavia. University of California Press. pp. 8–9. ^ David M. Crowe (13 September 2013). Crimes of State Past and Present: Government-Sponsored Atrocities and International Legal Responses. Routledge. pp. 61–. ISBN 978-1-317-98682-9. ^ a b Greenberg 2004, p. 115. ^ a b Jonke, Ljudevit (1968). "Razvoj hrvatskoga književnog jezika u 20. stoljeću" [The Development of the Croatian language in the 20th century]. Jezik (in Serbo-Croatian). 16 (1): 18. ISSN 0021-6925. ^ Kordić 2010, pp. 303–304. ^ a b Babić, Stjepan (2004). Hrvanja hrvatskoga [Croatian Language Quarrels] (in Serbo-Croatian). Zagreb: Školska knjiga. p. 36. ISBN 978-953-0-61428-4. ^ Milutinović, Zoran (2011). 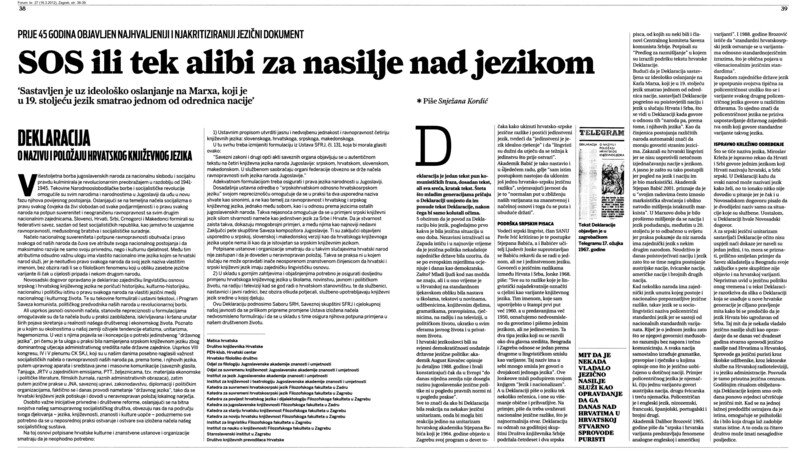 "Review of the Book Jezik i nacionalizam" (PDF). The Slavonic and East European Review. 89 (3): 522–523. ISSN 0037-6795. OCLC 744233642. ZDB-ID 209925-1. Archived from the original (PDF) on 2012-07-07. Retrieved 25 May 2014. ^ Jonke, Ljudevit (1955). "Drugi i treći sastanak Pravopisne komisije" [The second and third meeting of The Orthographic Commission]. Jezik (in Serbo-Croatian). 4 (2): 59. ISSN 0021-6925. ^ Jonke, Ljudevit (1961). "Pravopis hrvatskosrpskoga književnog jezika" [Serbo-Croatian Spelling-Book]. Jezik (in Serbo-Croatian). 9 (2): 57–59. ISSN 0021-6925. ^ Kordić, Snježana (16 March 2012). "SOS ili tek alibi za nasilje nad jezikom" [SOS, or nothing but an alibi for violence against language] (in Serbo-Croatian). Zagreb: Forum. pp. 38–39. ISSN 1848-204X. Archived from the original on 7 July 2012. Retrieved 9 April 2013. ^ Gröschel 2009, p. 72. ^ Mappes-Niediek 2005, pp. 18, 64. ^ Blum 2002, pp. 41–42. ^ a b c d Gak, Vladimir G. (1989). "K tipologii form jazykovoj politiki" [Towards a typology of language policy]. Voprosy Jazykoznanija (in Russian). 5: 122–123. ^ Blum 2002, pp. 47–48. ^ Gröschel 2003, pp. 160–161. ^ Blum 2002, p. 65. ^ Blum 2002, p. 81. ^ Blum 2002, pp. 73–79. ^ Blum 2002, pp. 69–80. ^ Kordić 2010, pp. 291–292. ^ Busch, Brigitta; Kelly-Holmes, Helen, eds. (2004). "Semantics of War in Former Yugoslavia". Language, Discourse and Borders in the Yugoslav Successor States. Clevedon: Multilingual Matters. pp. 51, 54. OCLC 803615012. ^ Kordić 2010, pp. 294–295. ^ Gröschel 2009, p. 38. ^ Kordić 2010, p. 299. ^ Ammon 1995, pp. 484, 494–497. ^ "Post-Yugoslav 'Common Language' Declaration Challenges Nationalism". Balkan Insight. ^ "Is Serbo-Croatian a language?". The Economist. 2017-04-10. ^ "Raziskava Položaj in status pripadnikov narodov nekdanje Jugoslavije vRS.pdf" (PDF) (in Slovenian). ^ Kordić 2006, p. 5. ^ Crosby, Alan; Martinovic, Iva (August 28, 2018). "In The Age Of The Internet, Serbia Aims To Keep Its Cyrillic Alive". RFE/RL. Retrieved 5 September 2018. ^ (in Serbo-Croatian) Gramatika hrvatskosrpskoga jezika, Group of Authors (Ivan Brabec, Mate Hraste and Sreten Živković), Zagreb, 1968. ^ E.g., big coastal Croatian cities Rijeka and Split together with their hinterland become basically completely Štokavianised during the 20th century, which had been Čakavian-speaking urban centres. ^ Greenberg 2004, p. 13. ^ a b Alexander 2013, p. 341. ^ Kafadar, Enisa (2009). "Bosnisch, Kroatisch, Serbisch – Wie spricht man eigentlich in Bosnien-Herzegowina?" [Bosnian, Croatian, Serbian – How do people really speak in Bosnia-Herzegovina?]. In Henn-Memmesheimer, Beate; Franz, Joachim (eds.). Die Ordnung des Standard und die Differenzierung der Diskurse; Teil 1 (in German). Frankfurt am Main: Peter Lang. p. 103. OCLC 699514676. ^ Bunčić, Daniel (2008). "Die (Re-)Nationalisierung der serbokroatischen Standards" [The (Re-)Nationalisation of Serbo-Croatian Standards]. In Kempgen, Sebastian (ed.). Deutsche Beiträge zum 14. Internationalen Slavistenkongress, Ohrid, 2008. Welt der Slaven (in German). Munich: Otto Sagner. p. 93. OCLC 238795822. ^ Thomas 2003, p. 325. ^ McLennan, Sean (1996). "Sociolinguistic Analysis of "Serbo-Croatian"" [Sociolinguistic Analysis of ’Serbo-Croatian’] (PDF). Calgary Working Papers in Linguistics. 18: 107. ISSN 0823-0579. Retrieved 10 August 2014. ^ Pohl 1996, p. 219. ^ Gröschel 2003, pp. 180–181. ^ Blum 2002, pp. 125–126. ^ Brozović, Dalibor (1992). "Serbo-Croatian as a pluricentric language". In Clyne, Michael G (ed.). Pluricentric Languages: Differing Norms in Different Nations. Contributions to the sociology of language 62. Berlin & New York: Mouton de Gruyter. pp. 347–380. OCLC 24668375. ^ Kordić, Snježana (2009). "Policentrični standardni jezik" [Polycentric Standard Language] (PDF). In Badurina, Lada; Pranjković, Ivo; Silić, Josip (eds.). Jezični varijeteti i nacionalni identiteti (in Serbo-Croatian). Zagreb: Disput. pp. 85–89. ISBN 978-953-260-054-4. OCLC 437306433. Archived from the original (PDF) on |archive-url= requires |archive-date= (help). (ÖNB). ^ Ammon 1995, p. 46. ^ Kordić, Snježana (2004). "Pro und kontra: "Serbokroatisch" heute" [Pro and con: "Serbo-Croatian" nowadays] (PDF). In Krause, Marion; Sappok, Christian (eds.). Slavistische Linguistik 2002: Referate des XXVIII. Konstanzer Slavistischen Arbeitstreffens, Bochum 10.-12. September 2002. Slavistishe Beiträge; vol. 434 (in German). Munich: Otto Sagner. p. 141. ISBN 978-3-87690-885-4. OCLC 56198470. Archived from the original (PDF) on |archive-url= requires |archive-date= (help). (ÖNB). ^ Kordić, Snježana (2008). "Nationale Varietäten der serbokroatischen Sprache" [National Varieties of Serbo-Croatian] (PDF). In Golubović, Biljana; Raecke, Jochen (eds.). Bosnisch – Kroatisch – Serbisch als Fremdsprachen an den Universitäten der Welt. Die Welt der Slaven, Sammelbände – Sborniki ; vol. 31 (in German). Munich: Otto Sagner. p. 95. ISBN 978-3-86688-032-0. OCLC 244788988. Archived from the original (PDF) on |archive-url= requires |archive-date= (help). (ÖNB). ^ Kordić, Snježana (2009). "Plurizentrische Sprachen, Ausbausprachen, Abstandsprachen und die Serbokroatistik" [Pluricentric languages, Ausbau languages, Abstand languages and Serbo-Croatian studies] (PDF). Zeitschrift für Balkanologie (in German). 45 (2): 213–214. ISSN 0044-2356. OCLC 680567046. ZDB-ID 201058-6. Archived from the original on 4 August 2012. Retrieved 21 January 2013. ^ Alexander 2006, p. 424-426. ^ Constitution of Montenegro, 2007, The official language in Montenegro shall be Montenegrin. […]Serbian, Bosniac, Albanian and Croatian shall also be in the official use. ^ Štiks, Igor (2015). Brothers United: The Making of Yugoslavs. Bloomsbury Publishing. p. 27. ISBN 9781474221542. Retrieved 1 May 2018. ^ Đorđe, Tomić (2017). "From "Yugoslavism" to (Post-)Yugoslav Nationalisms: Understanding Yugoslav Identities". In Roland, Vogt (ed.). European National Identities: Elements, Transitions, Conflicts. Routledge. p. 287. ISBN 9781351296465. ^ Alexander 2006, p. 425. ^ "Kordić's publications in Književna republika". Bib.irb.hr. Retrieved 2013-09-01. ZDB-ID 2122129-7. ^ Petković, Nikola (5 September 2010). "Mrsko zrcalo pred licima jezikoslovaca" [A nasty mirror reflects back at linguists] (in Serbo-Croatian). Rijeka: Novi list. p. 7 in the arts section Mediteran. ISSN 1334-1545. Archived from the original on 5 July 2012. Retrieved 18 July 2012. ^ Šnajder, Slobodan (10 October 2010). "Lingvistička bojna" [Linguistic battle] (in Serbo-Croatian). Rijeka: Novi list. p. 6 in the arts section Mediteran. ISSN 1334-1545. Archived from the original on 5 July 2012. Retrieved 6 July 2012. ^ Kordić, Snježana (2003). "Demagogija umjesto znanosti (odgovor Daliboru Brozoviću)" [Demagogy instead of science (response to Dalibor Brozović)] (PDF). Književna Republika (in Serbo-Croatian). 1 (7–8): 176–202. ISSN 1334-1057. Archived (PDF) from the original on 23 August 2012. Retrieved 8 April 2014. (CROLIB). ^ Kordić, Snježana (2004). "Autizam hrvatske filologije (odgovor Ivi Pranjkoviću)" [The autism of Croatian philology (response to Ivo Pranjković)] (PDF). Književna Republika (in Serbo-Croatian). 2 (7–8): 254–280. ISSN 1334-1057. Archived (PDF) from the original on 4 August 2012. Retrieved 1 March 2015. (NSK). ^ Mandić, Igor (21 November 2010). "Svojom polemikom možda pokušava izbrisati naš identitet... Što, zapravo, hoće ta žena?" [She is perhaps trying to destroy our identity by polemicising... What does that woman really want?] (in Serbo-Croatian). Zagreb: Jutarnji list. p. 19. ISSN 1331-5692. Archived from the original on 7 July 2012. Retrieved 12 August 2013. ^ Kordić, Snježana (2009). "Svijet o nama: Bernhard Gröschel, Das Serbokroatische zwischen Linguistik und Politik" [About us – World point of view: Bernhard Gröschel, Serbo-Croatian Between Linguistics and Politics] (PDF). Književna Republika (in Serbo-Croatian). 7 (10–12): 316–330. ISSN 1334-1057. Archived (PDF) from the original on 23 August 2012. Retrieved 6 October 2013. (NSK). ^ Trudgill, Peter (2003). A glossary of sociolinguistics. Oxford & New York: Oxford University Press. p. 119. OCLC 50768041. ^ Kordić, Snježana (2007). "La langue croate, serbe, bosniaque et monténégrine" [The Croatian, Serbian, Bosnian, and Montenegrin Language] (PDF). In Madelain, Anne (ed.). Au sud de l'Est. vol. 3 (in French). Paris: Non Lieu. p. 74. ISBN 978-2-35270-036-4. OCLC 182916790. Archived from the original (PDF) on |archive-url= requires |archive-date= (help). ^ Brozović, Dalibor (2002). "Europske integracije i hrvatski jezik" [European integration and the Croatian language]. Jezik (in Serbo-Croatian). 49 (4): 124. ISSN 0021-6925. ^ Kloss, Heinz (1976). "Abstandsprachen und Ausbausprachen" [Abstand-languages and Ausbau-languages]. In Göschel, Joachim; Nail, Norbert; van der Els, Gaston (eds.). Zur Theorie des Dialekts: Aufsätze aus 100 Jahren Forschung. Zeitschrift für Dialektologie and Linguistik, Beihefte, n.F., Heft 16. Wiesbaden: F. Steiner. p. 303. OCLC 2598722. ^ Pohl 1996, p. 214. ^ Kordić, Snježana (2004). "Le serbo-croate aujourd'hui: entre aspirations politiques et faits linguistiques" [Serbo-Croatian today: Between political aspirations and linguistic facts] (PDF). Revue des études Slaves (in French). 75 (1): 34–36. ISSN 0080-2557. OCLC 754207802. ZDB-ID 208723-6. Archived from the original on 4 August 2012. Retrieved 2 April 2014. (ÖNB). ^ Blum 2002, p. 134. ^ Haji Omar, Asmah (1992). "Malay as a pluricentric language". In Clyne, Michael G (ed.). Pluricentric Languages: Differing Norms in Different Nations. Contributions to the sociology of language 62. Berlin & New York: Mouton de Gruyter. pp. 401–419. ISBN 978-3-11-012855-0. OCLC 24668375. ^ Dua, Hans Raj (1992). "Hindi-Urdu as a pluricentric language". In Clyne, Michael G (ed.). Pluricentric Languages: Differing Norms in Different Nations. Contributions to the sociology of language 62. Berlin & New York: Mouton de Gruyter. pp. 381–400. ISBN 978-3-11-012855-0. OCLC 24668375. ^ Ammon 1995, pp. 154–174. Alexander, Ronelle (2006). Bosnian, Croatian, Serbian, a Grammar: With Sociolinguistic Commentary. Madison: University of Wisconsin Press. Alexander, Ronelle (2013). "Language and Identity: The Fate of Serbo-Croatian". Entangled Histories of the Balkans. 1. Leiden & Boston: Brill. pp. 341–417. Ammon, Ulrich (1995). Die deutsche Sprache in Deutschland, Österreich und der Schweiz: das Problem der nationalen Varietäten [German Language in Germany, Austria and Switzerland: The Problem of National Varieties] (in German). Berlin & New York: Walter de Gruyter. p. 575. OCLC 33981055. Blum, Daniel (2002). Sprache und Politik : Sprachpolitik und Sprachnationalismus in der Republik Indien und dem sozialistischen Jugoslawien (1945–1991) [Language and Policy: Language Policy and Linguistic Nationalism in the Republic of India and the Socialist Yugoslavia (1945–1991)]. Beiträge zur Südasienforschung ; vol. 192 (in German). Würzburg: Ergon. p. 200. ISBN 978-3-89913-253-3. OCLC 51961066. Brown, Edward Keith; Anderson, Anne, eds. (2006). Encyclopedia of Language and Linguistics. Amsterdam: Elsevier. ISBN 978-0-08-044299-0. OCLC 3945869. Bugarski, Ranko; Hawkesworth, Celia, eds. (2006). Language in the Former Yugoslav Lands. Bloomington: Slavica Publishers. p. 325. ISBN 978-0-89357-298-3. OCLC 52858529. Greenberg, Robert D. (2004). Language and Identity in the Balkans: Serbo-Croatian and its Disintegration (1st ed.). New York: Oxford University Press. Greenberg, Robert D. (2008). Language and Identity in the Balkans: Serbo-Croatian and its Disintegration (2nd updated ed.). New York: Oxford University Press. Gröschel, Bernhard (2003). "Postjugoslavische Amtssprachenregelungen – Soziolinguistische Argumente gegen die Einheitlichkeit des Serbokroatischen?" [Post-Yugoslav Official Languages Regulations – Sociolinguistic Arguments Against Consistency of Serbo-Croatian?]. Srpski Jezik (in German). 8 (1–2): 135–196. ISSN 0354-9259. Retrieved 18 May 2015. (COBISS-Sr). —— (2009). Das Serbokroatische zwischen Linguistik und Politik: mit einer Bibliographie zum postjugoslavischen Sprachenstreit [Serbo-Croatian Between Linguistics and Politics: With a Bibliography of the Post-Yugoslav Language Dispute]. Lincom Studies in Slavic Linguistics ; vol 34 (in German). Munich: Lincom Europa. p. 451. ISBN 978-3-929075-79-3. LCCN 2009473660. OCLC 428012015. OL 15295665W. COBISS 43144034. —— (2010). Jezik i nacionalizam [Language and Nationalism] (PDF). Rotulus Universitas (in Serbo-Croatian). Zagreb: Durieux. p. 430. ISBN 978-953-188-311-5. LCCN 2011520778. OCLC 729837512. OL 15270636W. Archived (PDF) from the original on 8 July 2012. Retrieved 21 April 2015. Lencek, Rado (1976). "A few remarks for the history of the term 'Serbocroatian' language". Zbornik Za Filologiju I Lingvistiku. 19 (1): 45–53. ISSN 0514-6143. Mappes-Niediek, Norbert (2005). Die Ethno-Falle: der Balkan-Konflikt und was Europa daraus lernen kann [The Ethnic Trap: the Balkan conflict and what Europe can learn from it] (in German). Berlin: Christoph Links Verlag. p. 224. ISBN 978-3-86153-367-2. OCLC 61665869. Pohl, Hans-Dieter (1996). "Serbokroatisch – Rückblick und Ausblick" [Serbo-Croatian – Looking backward and forward]. In Ohnheiser, Ingeborg (ed.). Wechselbeziehungen zwischen slawischen Sprachen, Literaturen und Kulturen in Vergangenheit und Gegenwart : Akten der Tagung aus Anlaß des 25jährigen Bestehens des Instituts für Slawistik an der Universität Innsbruck, Innsbruck, 25. – 27. Mai 1995. Innsbrucker Beiträge zur Kulturwissenschaft, Slavica aenipontana ; vol. 4 (in German). Innsbruck: Non Lieu. pp. 205–219. OCLC 243829127. Thomas, Paul-Louis (2003). "Le serbo-croate (bosniaque, croate, monténégrin, serbe): de l'étude d'une langue à l'identité des langues" [Serbo-Croatian (Bosnian, Croatian, Montenegrin, Serbian): from the study of a language to the identity of languages]. Revue des études Slaves (in French). 74 (2–3): 311–325. ISSN 0080-2557. OCLC 754204160. ZDB-ID 208723-6. Retrieved 17 August 2012. Banac, Ivo: Main Trends in the Croatian Language Question. Yale University Press, 1984. Bunčić, D., 2016. Serbo-Croatian/Serbian: Cyrillic and Latin. Biscriptality: A Sociolinguistic Typology, pp. 231–246. Franolić, Branko: A Historical Survey of Literary Croatian. Nouvelles éditions Latines, Paris, 1984. Franolić, B., 1983. The development of literary Croatian and Serbian. Buske Verlag. Greenberg, Robert D. (1999). "In the Aftermath of Yugoslavia's Collapse: The Politics of Language Death and Language Birth". International Politics. 36 (2): 141–158. Greenberg, Robert D. (2013). "Language, Religion, and Nationalism: The Case of the Former Serbo-Croatian". Typen slavischer Standardsprachen: Theoretische, methodische und empirische Zugaenge. Wiesbaden: Harrassowitz Verlag. pp. 217–231. Ivić, Pavle: Die serbokroatischen Dialekte. the Hague, 1958. Jakobsen, Per (2008). "O strukturalno-lingvističkim konstantama srpskohrvatskog jezika (inventar fonema i fonotaktička struktura)" [Serbocroatian structural-linguistic constants (inventory of phonemes and phonotactic structure)]. In Ostojić, Branislav (ed.). Jezička situacija u Crnoj Gori – norma i standardizacija (in Serbo-Croatian). Podgorica: Crnogorska akademija nauka i umjetnosti. pp. 25–34. ISBN 978-86-7215-207-4. (COBISS-CG). Kristophson, Jürgen (2000). "Vom Widersinn der Dialektologie: Gedanken zum Štokavischen" [Dialectological Nonsense: Thoughts on Shtokavian]. Zeitschrift für Balkanologie (in German). 36 (2): 178–186. ISSN 0044-2356. ZDB-ID 201058-6. Magner, Thomas F.: Zagreb Kajkavian dialect. Pennsylvania State University, 1966. —— (1991). Introduction to the Croatian and Serbian Language (Revised ed.). Pennsylvania State University. Merk, Hening (2008). "Neka pragmatična zapažanja o postojanju srpskohrvatskog jezika". In Ostojić, Branislav (ed.). Jezička situacija u Crnoj Gori – norma i standardizacija (in Serbo-Croatian). Podgorica: Crnogorska akademija nauka i umjetnosti. pp. 295–299. ISBN 978-86-7215-207-4. (COBISS-CG). Murray Despalatović, Elinor: Ljudevit Gaj and the Illyrian Movement. Columbia University Press, 1975. Spalatin, C., 1966. Serbo-Croatian or Serbian and Croatian? : Considerations on the Croatian Declaration and Serbian Proposal of March 1967. Journal of Croatian Studies, 7, pp. 3–13. Zekovic, Sreten & Cimeša, Boro: Elementa montenegrina, Chrestomatia 1/90. CIP, Zagreb 1991. Wikimedia Commons has media related to Serbo-Croatian language. Ethnologue 15th Edition report on western South Slavic languages. Integral text of Novi Sad Agreement (In Serbo-Croatian). Serbian and Croatian alphabets at Omniglot. 1 Also referred to as Torlakian dialect which is transitional between Bulgarian, Macedonian, and Serbo-Croatian. This page was last edited on 8 April 2019, at 04:06 (UTC).